"Just when you think you're in a northern version of the USA (Kmart check, Wal-Mart check, Computer City check), a black bear will unexpectedly join you for tea; or 20 hours come and go without the sun setting; or you don't see the sun at all; or a wolf slays a yearling moose in the park. " Don't expect to find your own way. Let expert guides show you the hidden wonders of Alaska, the endemic plants, the secluded alcoves, and the granite-walled gorges carved deep into the state's jagged edges. Don't underestimate the forces of nature. Remember mosquito repellant. and bring rain gear to cover you from head to toe and plenty of clothes to layer on when the wind blows and peel off when the sun peeks through the mist. 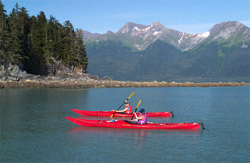 Alaska's varied terrain has some of the country's best scenic routes. For the easiest way to enjoy wildlife, tote powerful binoculars and remember to ask your guides if they carry spotting scopes. Heed the bears, don't feed them. 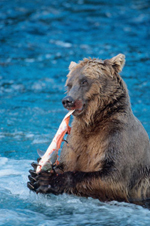 Don't feed any wild animals; Alaska is not a zoo. Bone up on the stories and history of the regions you plan to visit. Be conscious of the fact that quaint towns are living communities. Listen to the fishermen, roughnecks, artisans, bush pilots, prospectors, guides, and business owners. Listen closely and you will hear Alaskan voices reveal the rugged splendor of the land. Learn to listen, to observe, and to reflect. Take pictures. Let your journey develop slowly, like film in a chemical basin, until the wholeness of Alaska comes into clear view.